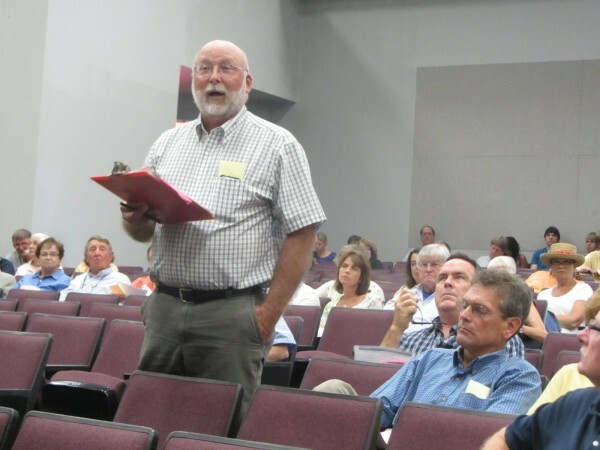 St. George Select Board Chair Bill Reinhardt raises an issue during a July meeting about the Regional School Unit 13 budget. The number of Maine communities breaking off from school districts continues to grow but it remains a small percentage. Since the state approved a law in 2007 to encourage the consolidation of school districts, nine municipalities have withdrawn from districts and five other communities will join the list as of July 1. Most of those separations are amicable although the one being negotiated between St. George and the Rockland area school district is anything but that. She said it was critical that communities be thoughtful about the decision and feel confident that withdrawing will address the problems that initiated the effort. Thus far, Starks, Portage Lake, Frankfort, Glenburn, Veazie, Cherryfield, Eustis, Athens and Brighton Plantation have withdrawn from their school districts since 2008. Last fall, six additional towns voted to withdraw including Wiscasset, Saco, Ellsworth, Hancock, Lamoine and Dayton. Those breakups take effect July 1. Many other communities are also considering or at various stages of attempting to withdraw. Retired University of Maine education professor Gordon Donaldson said that the 2007 consolidation law was billed by its backers as a uniform solution to financial woes and educational ambitions for districts. That has not turned out to be the case for many communities, he said. Donaldson said that in both this consolidation and in the prior series of consolidations in the 1960s and ’70s, administrative costs as a percentage of overall spending increased. He said organizations such as school districts tend to increase administration when they get larger. “In a larger district, for example, transportation gets big enough that the superintendent or assistant superintendent no longer can do it. In smaller districts, superintendents tend to wear many hats. In larger districts, they hire people to wear those hats,” Donaldson said. Disagreements over costs and local control have led to many of the efforts by towns to separate. All eight municipalities within RSU 20, based in Belfast, are at various points in the withdrawal process. Those communities include Belfast, Searsport, Stockton Springs, Belmont, Morrill, Northport, Searsmont and Swanville. Belfast voted in February to spend $25,000 to put together a report on the educational and financial impacts of leaving RSU 20. A committee representing Winterville Plantation approached SAD 27 earlier this year asking the board to consider its request to leave the district. West Bath residents voted in January to begin the withdrawal process from RSU 1 which also includes Arrowsic, Bath, Phippsburg and Woolwich. Local control of costs, school choice and preservation of the town’s school were driving factors in the effort. And in December, Freeport residents voted to begin the process of withdrawing from RSU 5 which also includes Durham and Pownal. St. George is also working toward withdrawing from RSU 13 based in Rockland but that effort is mired in a dispute between the town and school board. The two sides are far apart on terms of the withdrawal. RSU 13 also includes Thomaston, Owls Head, South Thomaston and Cushing. The formation of RSU 13 was approved by voters in the six Knox County towns in November 2008. The merger received support from 63 percent of the district voters although in St. George it failed 639-120. St. George formed a withdrawal committee after residents gave their backing in a May 2013 vote. The withdrawal committee made a proposal to RSU 13 on terms of the divorce but a counteroffer by RSU 13 has been met with harsh criticism from St. George. RSU 13 has strongly defended its position as in the best interest of the overall district. Bill Reinhardt who is both chair of the St. George Withdrawal Committee and the town’s board of selectmen said they have researched all the other withdrawal agreements in the state and have found none in which the negotiations were as difficult as this one. “Unfortunately we are an anomaly,” Reinhardt said. The district’s negotiating committee includes former RSU Chairwoman Esther “Tess” Kilgour who is also circulating a petition for Rockland to explore the option of withdrawing from RSU 13. That petition, posted at Rockland City Hall, had 19 signatures as of Thursday. In addition to Kilgour, former board members Minda McVetty and Brian Messing signed the document. “The counterproposal is both unduly harsh, punitive, and coercive against St. George and financially irresponsible and demeaning for RSU 13 and its remaining constituent towns and taxpayers,” said Reinhardt. RSU 13 is rejecting the St. George proposal to allow its students to attend RSU 13 high schools on a tuition basis for 10 years after the first year of the breakup. “RSU 13 would need to hold its doors open to all St. George students, with no commitment that St. George will send them, and then subsidize a low ball tuition rate to boot,” the letter from the board’s negotiating committee stated. Reinhardt said the district rejected the idea to take St. George students before the amount to be paid was discussed. He said another counteroffer is being made to the district. The town committee asked the state this week for another 90 days to negotiate a deal. Warren, the state education department spokeswoman, said if a town cannot reach a consensus on a withdrawal agreement that is a local issue and not one the state has the authority or interest in being the arbiter. For St. George, the impetus to withdraw was fueled largely by the RSU 13 board’s decision to move eighth-graders from the St. George School to the Oceanside High School West in neighboring Thomaston. Town residents voiced concern in October 2012 about the impact of continuing budget cuts on education offered in the district. Other communities that considered but failed to withdraw were Arundel in November 2012 and Monmouth in June 2013, Warren pointed out. While a town may vote to pursue withdrawal, that passage of that does not legally bind the withdrawal committee to reach a withdrawal agreement and ultimately bring that to a final public vote, she said. Buckfield, by way of example, is pursuing a second town referendum to stop the withdrawal process before completion of their withdrawal agreement. The state education department continues to support efforts that produce savings and increase efficiencies and innovations while allowing tax dollars to be focused in the classroom, Warren said. “We believe these regional district units can really foster that if towns are willing to work together,” the department spokeswoman said. Maine has 236 districts for about 185,000 students. Of those 170 have fewer than 1,000 students, she said. New Hampshire has about 100 districts for about 207,000 students, she pointed out. Correction: Northport is also one of the eight towns in RSU 20 considering withdrawal from the school district. Northport was omitted from the original version of the story.